During this season we heard a lot about a young polish thrower: Konrad Bukowiecki. This athlete, born in 1997, managed to overcome his limits countless times in the past months, easily establishing new European and World records. Despite the holiday period, contrary to other athletes who took their time to have a rest, Konrad didn’t lose his shape and decided to gift himself the umpteenth record. 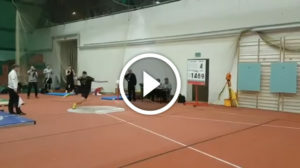 As we already know, anytime the polish athlete sets a new personal best, a big record falls: this time it was the turn of the Indoor World Junior Record. On the 28th of December, in Spala, with a best shot worth 22.96m (and a second best of 22.79m) Bukowiecki brushed up against the 23m wall, which could be demolished very soon, as he announced on his facebook page. So this year ended with a bang for the polish athlete, who doesn’t see his target too far away.